Archaeologists tell us that inland migration in the eleventh and twelfth centuries generally followed Maunawili and Kahanaʻiki streams into Maunawili valley with population concentrated at Kukanono (around the Castle Hospital area) and Maunawili, where fresh water was plentiful in both places. In ancient times, the natural springs of Maunawili fed a network of streams that laced the valley: Makawao, furthest back in the valley; Ainoi, Maunawili, Omao and Palapu, all of which flowed into a common tributary to Kawainui. A separate branch further toward the Pali, Kahana’iki, also fed the marsh. Irrigated loʻi – interspersed with ti and popolo (black nightshade herb) plantings – stretched to Kawainui’s fishponds. There the streams fed nutrient-rich water into the ponds to nurture limu (algae) for the fish as well as to sustain lepo’ai’ai, edible mud the color of poi and the texture of haupia. James Boyd, a British seaman (and Kamehameha confidant) is believed to be the first white landowner in the Kailua area. He and his descendants operated the Maunawili Ranch until it was acquired by William G. Irwin, a sugar factor. The ranch was one of the largest cattle operations on Windward Oahu in the 19th century. Irwin bought up the valley in the early-1890s as watershed to irrigate a Waimanalo sugar plantation. In addition, he and others experimented with other crops. At first, rice paddies replaced the taro lo’i (starting in about the 1860s.) In 1894, Irwin’s Maunawili ranch manager, George Gibb, began planting coffee. He expanded his planting each year thereafter until 1900, by which time over 110-acres were planted in Liberian beans (a coffee mill was later added.) Gibb’s records show he planted “300 Carica papaya” in December of 1902, suggesting he was the first to plant solo papayas in Hawai’i. Avocado and cacao were planted the following year. In 1904, Kona oranges were attempted along with 210 Eucalyptus Robusta; more Kona oranges and mangosteen, possibly for the first time in Hawaii, were tried in 1905. Koa and Chinese banyan were planted in 1906 and Kola nut in 1910. Some of these early plantings took decades to mature. In April of 1939, the ranch manager reported fruits on trees dating back to 1905. But by then he had lost hope for Brazilian Cherries dating to 1903, an Apple variety of approximately the same time, and several other trees going back as far as 1900. All this experimentation was a sideline to Maunawili’s value as the only promising water source for the perpetually-parched Waimanalo plantation. In 1900, to explore that promise Irwin retained M. M. O’Shaughnessy, a civil engineer celebrated for building early dams and tunnels in California and Hawaii. If Maunawili could be tapped for another four million gallons during a four-month dry season, plantation manager George Chalmers forecast another 1,000 tons in annual sugar production. A forest reserve line was proposed that would take in ranch land then used for pasturage, “a large portion of which . . . suitable for pineapple cultivation.” But the benefits of a reforestation program to stabilize water flow for the summer months at Waimanalo out-weighed this consideration. Under Brewer, from 1924 through 1926, there was a massive cultivation effort with nearly 80,000 trees in the three year period. Juniper, Mahogany, Australian cedar and tropical ash were among them. From 1927 through 1932 a total of 45 different varieties of fruit trees were introduced to the valley by Brewer ranging from Allspice to water apple. By 1931, a large number of solo papaya trees and many varieties of banana were growing plus a total of nearly 11,000-cashew trees. The cashew plantings had resulted in “excellent growth” but a serious blight affected the blossom “if the blossom season occurs during wet weather;” the cashew nut crops had been poor. Australian Macadamia plantings were placed between the solo papaya trees in 1936; at that time, avocados, limes, banyan and coconut trees also were carried on the ranch’s rolls. In the summer of 1939 the UH College of Agriculture advised Brewer to embark on the cultivation of papaya at Maunawili on a large scale and the ranch manager was instructed to give the proposal serious evaluation. That fall, the Territorial Board of Agriculture & Forestry asked for Hayden mango tree branches for propagation and permission to release pheasants in the valley. The ranch manager was against introducing any further pheasants because they damaged young growing plants, especially papaya, and suggested doves as a better choice because they fed on weed seeds rather than plants. Lili‘uokalani used to visit friends at the Boyd estate in Maunawili. She and her brother King David Kalākaua were regular guests and attended parties or simply came there to rest. Guests would walk between two parallel rows of royal palms, farewells would be exchanged; then they would ride away on horseback or in their carriages. On one trip, when leaving, she witnessed a particularly affectionate farewell between a gentleman in her party and a lovely young girl from Maunawili. As they rode up the Pali and into the swirling winds, she started to hum a melody weaving words into a romantic song. The Queen continued to hum and completed her song as they rode the winding trail down the valley back to Honolulu. 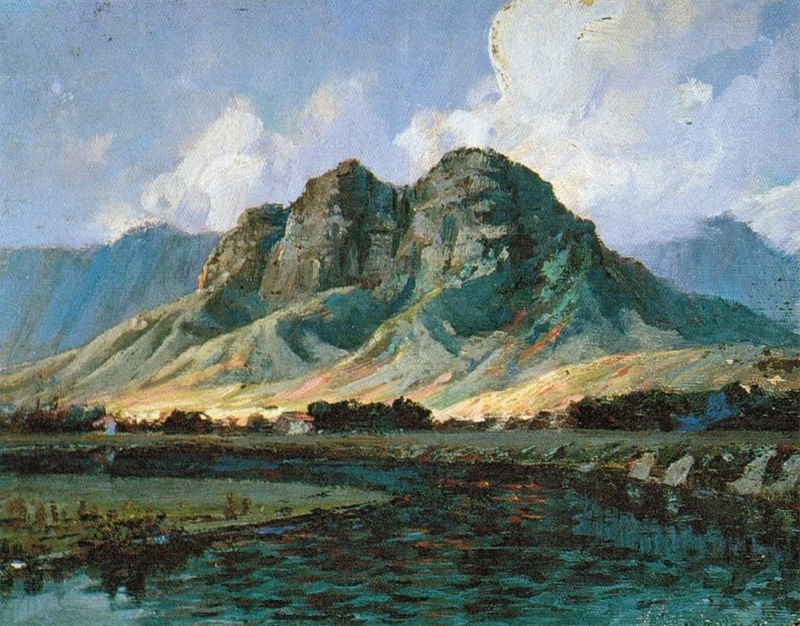 The image shows ‘Maunawili Peaks (Olomana) from Kailua’ by D Howard Hitchcock (1910s.) In addition, I have included other related images in a folder of like name in the Photos section on my Facebook and Google+ pages.